I’m excited to announce the recent release of our next-generation service catalog software, Cisco Prime Service Catalog version 10.0. In most organizations, there is no single system or “app store” that end-users can use to request all the IT tools and services they need to do their job. There are typically different siloed processes for ordering, fulfilling and tracking each of those IT resources (e.g. mobile devices, laptops, applications, infrastructure, access to systems). And with the continued proliferation of new technologies and applications, this has become increasingly frustrating for end-users – and more challenging for IT service delivery teams. Cisco Prime Service Catalog provides a modern and unified approach to solve these problems, with a simple and user-friendly service catalog that eliminates the complexity of ordering services across these different IT silos. The results? Increased productivity for end-users. Faster and more efficient IT service delivery. Higher IT customer satisfaction scores and greater IT-business alignment. A next-generation HTML5 user interface with new capabilities. 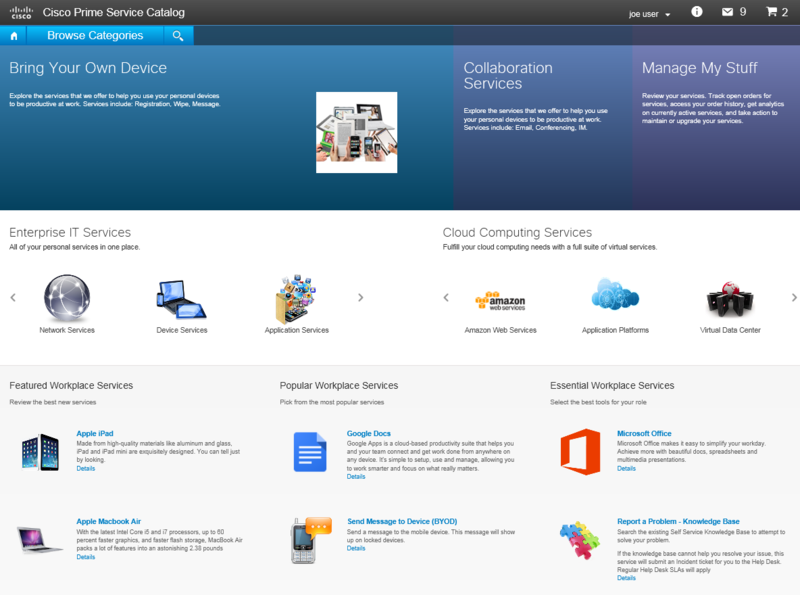 The user experience for our IT service catalog was inspired by consumer internet sites and app store concepts, and developed in collaboration with Cisco’s own IT organization. In this modern new user interface, end-users can easily search and filter for different apps and tools to find specific services, select and configure the options they want, and place them in their shopping cart. Flexible policy frameworks to enable greater control of available IT services. For example, we’ve added new quota functionality for managing IT resource requests. Quotas are especially useful when automating the delivery of finite resources like storage or compute capacity, or managing against departmental budgets or grants. Another examples is our new policy alerts and enforcement for lease expirations, to notify users before auto-expiring their access to particular resources. Providing your users with the option to automatically extend or cancel their lease can improve resource utilization and increase customer satisfaction. 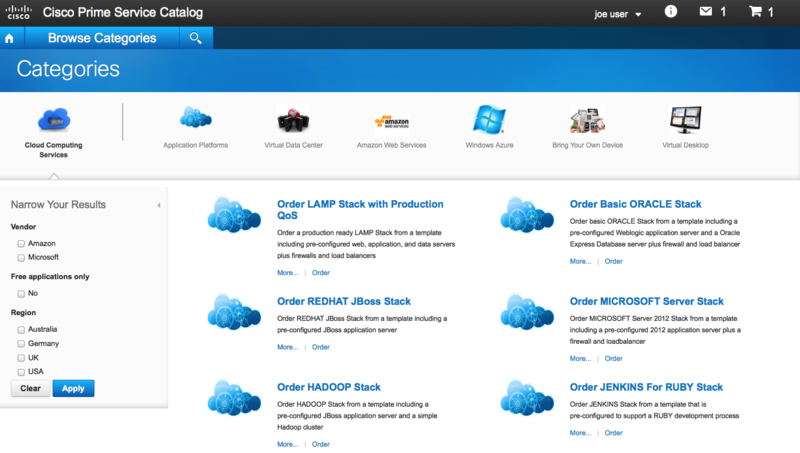 You may have heard the buzz about the internal Cisco IT deployment of Cisco Prime Service Catalog, dubbed the “eStore”. It’s been featured in a number of articles in the media as the internal enterprise app store that powers Cisco’s BYOD and mobile apps program – and provides Cisco employees with a one-stop shop for all IT services (from desktop to data center). If you’re attending Cisco Live in Milan later this month, you can learn more about the case study in this “Inside Cisco IT” session here. Another service catalog case study that we’re featuring at Cisco Live Milan is Steria. Steria is a great example of one of our service provider customers in Europe; they’ve used Cisco Prime Service Catalog to enable on-demand, self-service delivery for a broad range of IT workplace services, including desktop and mobile applications. You can read more in my earlier blog post – or if you’ll be in Milan, check out the session here. During the week of Cisco Live Milan, you will also hear more about Cisco Prime Service Catalog version 10.0 in the context of our soon-to-be-announced new release of Cisco Intelligent Automation for Cloud (IAC). Cisco Prime Service Catalog is one of the bundled components within this cloud management software solution, so the enhancements in version 10 are also reflected in the upcoming new release of Cisco IAC. You can join one or more of the Cisco Live Milan sessions listed here to learn more about Cisco IAC. 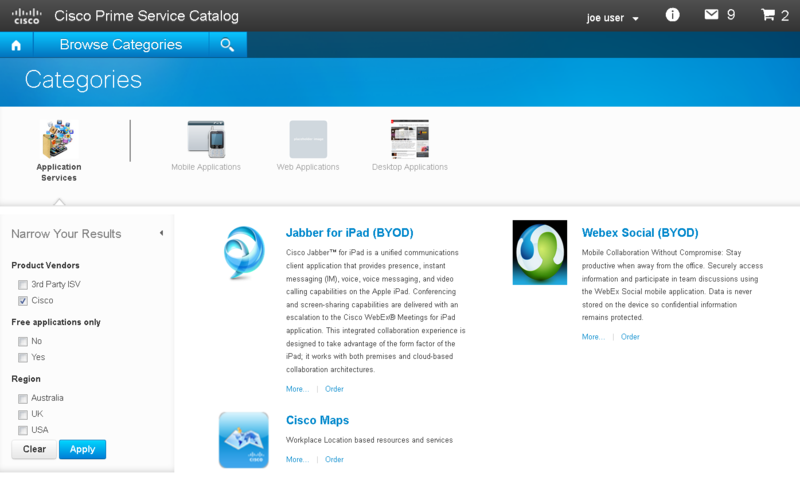 In the meantime, check out http://cisco.com/go/service-catalog to learn more about Cisco Prime Service Catalog.